Sometimes you just need a little bit of sweetness. And chocolate is an incredible superfood that will do more than hit that sweet spot! It’s also amazing for you-full of minerals and antioxidants. Studies have shown that it helps to improve brain function, lowers blood pressure, and protects against heart disease. 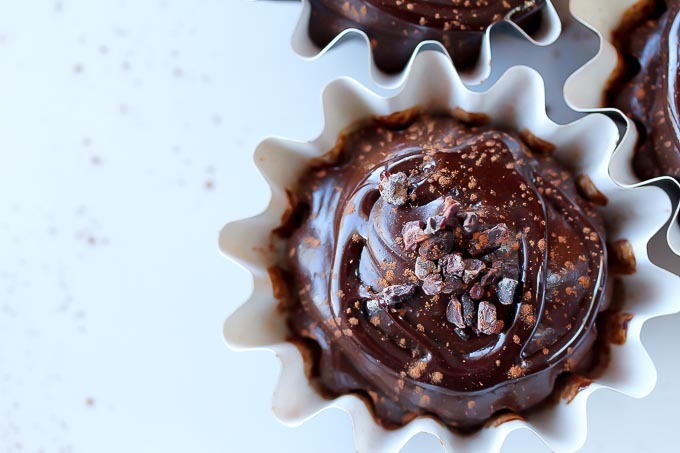 This is an easy raw vegan chocolate mousse that is nut free and is so rich and creamy no one will ever suspect it is actually good for them! This recipe can be poured into any size mold and it will set up beautifully-sometimes I make it as a whole pie with a walnut and date crust. It sets up into a sliceable cheesecake like consistency. 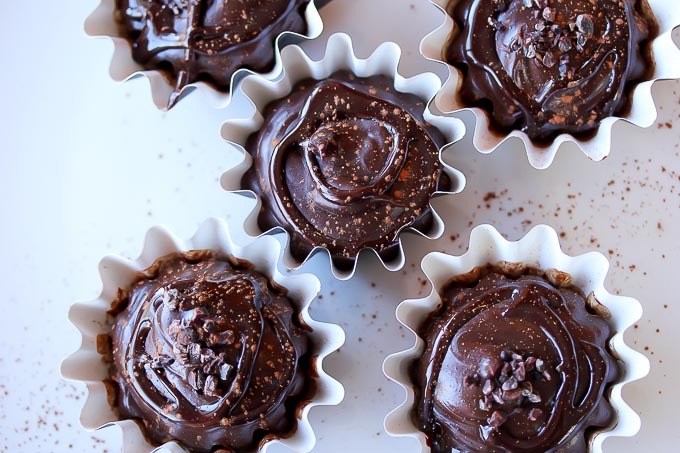 Initially it’s a very soft consistency, almost like a pudding, so you can sprinkle toppings of your choice and they will set into the top, such as cacao nibs, goji berries, shredded coconut, etc…The avocado base will fool even the pickiest chocolate lover! Cream avocados in a food processor with liquid coconut oil, agave, lecithin, vanilla and salt. Slowly add the cacao powder with the food processor running until the powder is completely incorporated. The ganache should have the consistency of chocolate pudding at this point. Pour into whatever containers you are using (little decorative portion cups as pictured above work nicely) and refrigerate for at least one hour to set. One note about the coconut oil-it must be in liquid form for this recipe. If your coconut oil is solid and white simply set the jar in a bath of warm water until enough of it melts into a liquid. 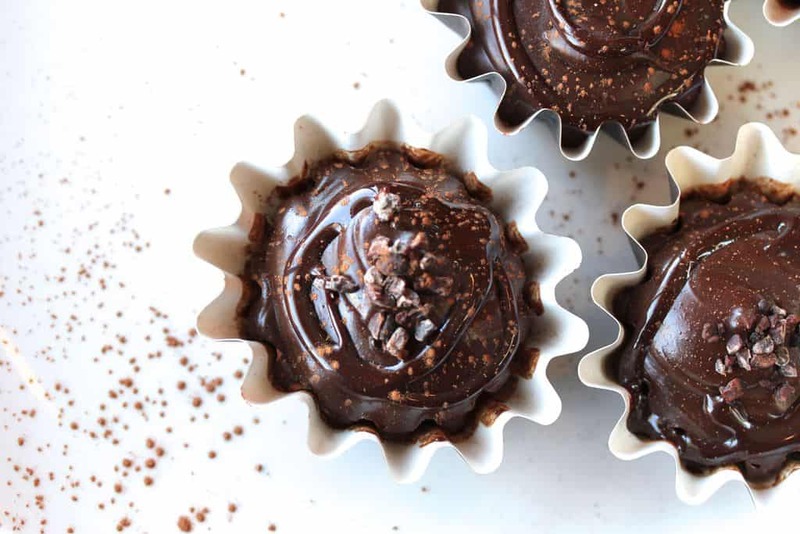 These mousse cups should be refrigerated as they will melt on a hot day. They freeze extremely well, and you can even eat them directly out of the freezer. Previous Post: « Vegan Kimchee + bonus salad recipe! Hey – Just wondering how much salt to put in? I see you add salt in the directions but it does not say an amount. Thanks – can’t wait to try them! Oh thank you for pointing that out! I will fix that! It should be 1 pinch or 1/4 teaspoon. Do I have to use lecithin can’t find it here and don’t use soy ? You can also use sunflower lecithin if you can find it, same quantity.